I know asking if tOSU cheated is like asking if a bear &%$! in the woods...but hear us out. According to a piece by ESPN's Big Ten blogger Adam Rittenberg [story], tOSU might have been stealing signals from Oregon during this year's Rose Bowl where tOSU spanked the Ducks 26-17. Now I'll admit, I watched the Rose Bowl. And what I saw was an Oregon offense that was remarkably underwhelming considering how well they had played throughout the year, and a tOSU defense that played remarkably better then they had played throughout the year. I pretty much just chalked it up to tOSU being much better prepared, and Oregon being not so much. But now, it seems that there might have been some shenanigans going on in the tOSU booth. Ohio State was so successful at stopping Oregon’s offense in its 26-17 win over the Ducks in the Rose Bowl that, at times, it seemed as if the Buckeyes knew what was coming. “There were a couple times last year when we kind of felt like our signals were, maybe, compromised,’’ offensive coordinator Mark Helfrich said. 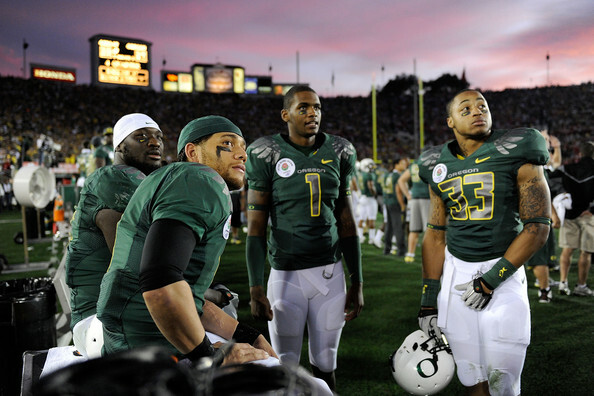 Now, it should be stated that no one really knows for sure if Oregon's signals were compromised for sure or not. There are no specific examples mentioned from the Rose Bowl. But it seems as if the Oregon coaches feel like tOSU was up to something, thus the changes for 2010. Of course, if tOSU did steal signals, there's nothing officially wrong with that, just morally. But since when have little things like morals ever gotten in the way of success at tOSU? It's very important to note that Helfrich never calls out Ohio State by name or cites specific examples from the Rose Bowl. The reporter makes a stronger suggestion than the coach does. But when you look at Oregon's incredible offensive numbers from 2009 and how rarely the Ducks struggled to move the ball and score points, it's a good bet Helfrich was referring to Ohio State. Oregon scored 31 points or more in 10 games last fall and eclipsed 40 points seven times. The Ducks put up just 17 against Ohio State despite having great field position all game. Did the Buckeyes steal signals? We might never know for sure, but I don't think it's why they won the Rose Bowl. I saw a physically superior group of defenders execute the scheme and their fundamentals against a gimmicky offense. Ohio State was extremely well prepared for the game, and Oregon ball carriers didn't have the room to run or the arm tackles that they were accustomed to in the Pac-10. Safe to say, we'll never really know for sure. But it seems likely that if it made the pages of Adam's blog, there is something to this. Morals? You want to talk about morals? Your head coach at the University of Michigan is morally bankrupt. Rich Rod? A cheater? Say it ain't so!! !